A co-op is a group of people who band together to meet common needs and make an investment in their community. We are your friends, neighbors, relatives, local small business owners, and others who share concerns about the impact of our food and grocery choices on the health of our families, our community, our economy and our environment – and are creating a member-owned, community-oriented, full-service grocery market that addresses those concerns! The Co-op equity investment is $400… $360 if you pay it all at once, or four annual payments of $100. To ensure that even those on limited budjets can become member/owners, there is a third option… Just let us know. What's in it for me now, before the store opens? Upon first meeting Malaika Spencer and Amanda Midkiff, the owner and manager of Roots to River Farm, I could see and feel their dedication and passion. Amanda was busy getting seeds ready for planting while Malaika verbally listed tasks to come. It was the perfect scene: a welcoming stone home at the top of the driveway, the fields set back a ways from Sugan Road and separated by a hedgerow, the quiet of the country. It was easy to see why Amanda and Malaika love what they do. Read more here. Doylestown Food Co-op and Bucks County Foodshed Alliance present Locavore at County Theater. On June 6 at 7:30p.m., the Doylestown Food Co-op and the Bucks County Foodshed Alliance will present Locavore, an inspiring and upbeat documentary about the benefits of returning home to our food supply. Locavore is a documentary that takes an optimistic and informative approach to presenting the benefits of sourcing food locally. Digging deep into our basic human connection to the land and agrarian life, the film takes a positive look at the benefits to our health and to our communities when we reconnect with our farmers and local food producers. Encouraging us as individuals and communities to incorporate food growing into our every day spaces, Locavore emphasizes the importance of rediscovering the basic gardening skills that we lost as a result of the industrialization. The film is the second installment of the Co-op's Farm Fresh Film Series, four documentary films that tackle the issues inherent in our food system today. Part of a community outreach project, the film series promotes the idea that what we put in our bodies impacts our health, our community, and our world. Each film is followed by a panel discussion, and we encourage the community to ask questions and participate in the conversation. We thank our "kale sponsors" (kale being one of our healthiest foods!) Natural Awakenings, Doc Baker's Farmulations, and Holistic Healing Center for their support! Cost: $10 ($8 for Co-op members). These three smoothies are sure to please your palate while making great use of the bounty of kale we have at our local farm stands right now! Michael made these up for us for our Press Event at the Bucks County Project Gallery last week. Find the recipes here (requires web login). We are so grateful to Stephanie Lisle for providing us the opportunity to collaborate with the Bucks County Project Gallery's May exhibit. We teamed up to show the beauty, wonder, and importance of "eating our view". On May 23rd, we invited the press to share local food and wine and learn more about us and our new friends from Roots to River Farm. See what local chef and co-op member Michael Kanter cooked up for us with the bounty from Barefoot Gardens, Mainly Mushrooms, Klein Dairy and much more. Learn more here. WERE YOU THERE? - LOCAL LIVE @ PUCK ROCKED!! We had a party and lots of people came! There was amazing local food and local music at a local venue supported by people who all appreciate one or the other (or both) and came out to show that support in droves to raise money for the Doylestown Food Co-op! A huge shout out and "thank you!" to all at Puck Live. Were you there? Co-op members Jean Cauller and Gregg Oliver enjoyed dinner at The Sweet Spot during our last fundraiser there. Read their fun review. I magine being a Harvard-educated young woman living in Manhattan and traveling extensively as a writer. Glamorous, yes? Imagine giving up this life....abandoning everything you THOUGHT was important.....to create and maintain, with an optimistic, energetic, self-reliant, stubbornly courageous young farmer named Mark, a farm in northern New York State. A farm that provides 100 families with essentially everything they need for a healthful diet, year round! Forty different vegetables, as well as beef, chicken, pork, eggs, milk, grains, flours, dried beans, herbs and fruits. No pesticides, no herbicides. Milking cows by hand. Horses instead of tractors. Fiction? Fantasy? NO!!! MEMOIR! 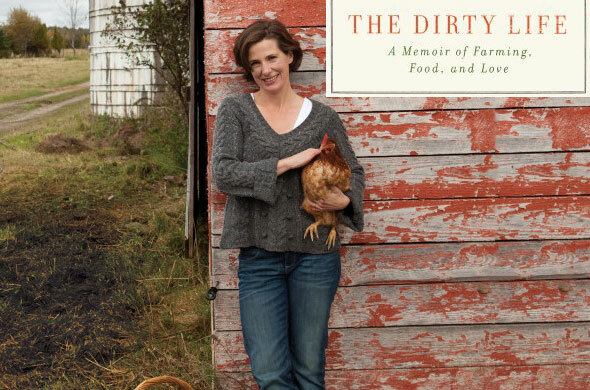 The Doylestown Food Co-Op’s "Food for Thought" book of the month for May was "The Dirty Life” by Kristin Kimball (2010). Led by Jess Kirwan-Shaw, a community of people who care about their food and the environment gathered at the Doylestown Book Store on Tuesday, May 14 to nibble home-made, healthful snacks and to discuss this memoir. Read the rest of the review here. Are you a member of the Doylestown Food Co-op? Start saving today with our Eco-System partners. Community Education Center (CEC). The CEC is truly that! In addition to providing personalized and varied childcare in the community, they warmly open their “home” to many groups… birthing classes, a book club, and more. We are so grateful that the Doylestown Food Co-op has been supported so strongly by the CEC family and have been able to hold meetings and events at this wonderful facility. We invite you to consider them for your childcare needs. Free registration is offered to Co-op members for any CEC Child Care program. To read a great review of last month's featured partners, The Sweet Spot and Basically Burgers, click here. Learn more about all of the discounts offered by our Eco-System Partners.